Spanish retailer Casadellibro is now carrying several ereaders, including the premium Tagus Iris, the budget Tagus Tactil, and the Tagus Lux. The Lux is a 99 euro ereader which was originally developed by Onyx. It tuns an unnamed OS on a dual-core 1.2GHz CPU with 512MB RAM and 4GB of internal storage. 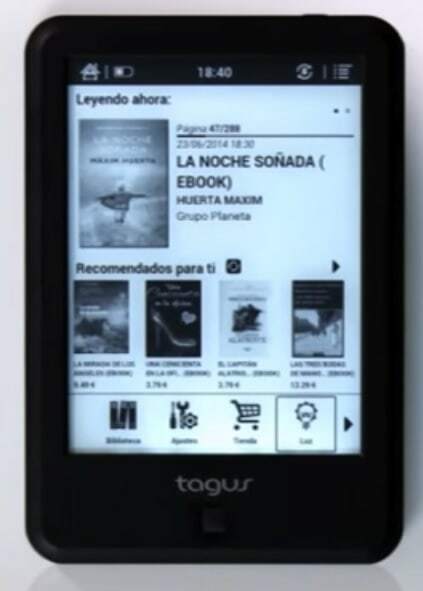 This ereader sports a 6" Carta E-ink screen (1024 x 758 resolution) with touchscreen and frontlight. It also has Wifi, page turn buttons, a headphone jack, and a microSD card slot. Weighing in at 180 grams, the Tagus Lux packs in a 1.7Ah battery and measures 8.7 mm thick. All in all it's not a bad ereader, but if you need more storage or a bigger battery then you should consider the Tagus Iris. According to the spec sheets the two ereaders are functionally identical aside from the internal storage (4GB vs 8GB) and the battery (1.7Ah and 3Ah). The Tagus Iris costs 30 euros more than the Tagux Lux, but I don't think it is worth it. It doesn't even have a sharper screen, and there's no mention of an OS like Android which means you can't expect to install apps.